Some clients find it difficult to generate treatment goals for therapy. This simple handout presents problems that some people bring to therapy. It can be used as a good starting point for a discussion. 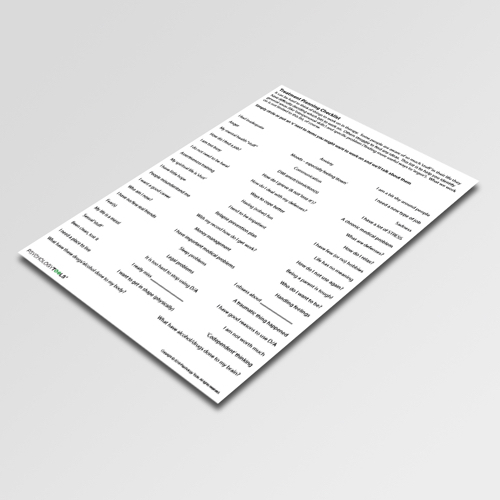 The Treatment Planning Checklist is a list of common therapeutic goals. Good CBT is dependent upon the therapist and client identifying an appropriate treatment goal (SMART goal). However, some clients find it difficult to identify appropriate therapeutic goals. The canonical reference for treatment goals is the Bern Inventory of Treatment Goals (Grosse & Grawe, 2002). This worksheet was submitted by Alan Taylor. 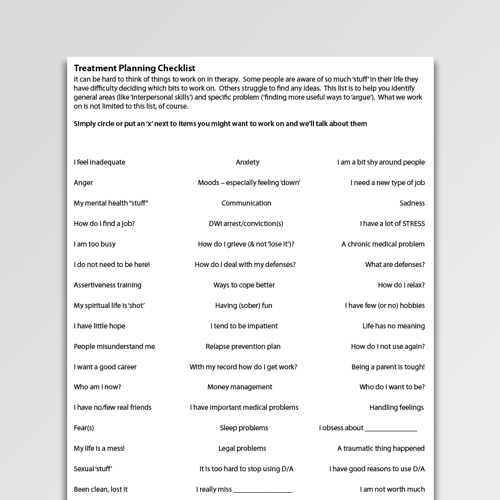 This worksheet can be used as a talking-point during an assessment and goal-setting phase of therapy. Grosse, M., & Grawe, K. (2002). Bern Inventory of Treatment Goals: Part 1. Development and first application of a taxonomy of treatment goal themes. Psychotherapy Research, 12(1), 79-99.